One of the most recognizable remnants of Japan's so-called "Tomb period" is the tomb of Emperor Nintoku, who is said to have reigned during the 4th century. From around the middle of the 11th century B.C.E. to 300 B.C.E., Japan was populated by a Neolithic civilization called the Jômon (rope pattern) culture. This group of hunters and gatherers decorated their pottery by twisting rope around the wet clay, to produce a distinctive pattern. Remnants of their pit-dwellings and enormous mounds of discarded shells mark the locations of their settlements, which were scattered throughout the islands. But it wasn't until the Yayoi period (300 B.C.E. to 250 C.E.) that Japan became a rice-loving culture. With the transmission of wet-field rice cultivation from the continent, the Yayoi people followed techniques for irrigation, planting, and harvesting that are still used in modern agriculture. 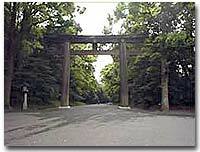 The entrance gate to a Shinto shrine is called a torii. Once one enters a shrine, he or she must go through an elaborate cleansing ritual. The sick and injured are not allowed in the temple at all because they are considered unclean. The Tomb period (250 C.E.-552 C.E.) gets its name from the massive tombs that dot the landscape to this day. The most impressive of these is the awe-inspiring tomb of Emperor Nintoku, who may have reigned from about 395 to 427 C.E. 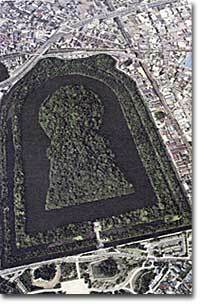 Measuring 2,695 feet long and covering an area of 80 acres, this tomb near Osaka has a distinctive keyhole shape and is encircled by a moat. The first written records about and by the Japanese date from this time. Contemporary Chinese histories describe Japan (or the "Land of Wa") as a tributary nation ruled by an unmarried queen named Pimiko who occupied herself with magic and sorcery. Japanese historical chronicles explored the country's origins and elaborated on the legendary roots of the Japanese rulers through stories. By the Yamato period (552-710), the hundreds of clans scattered throughout the country were unified under a single clan, the Yamato, who traced their lineage to the sun goddess Amaterasu. This connection made them powerful political and religious leaders with the divine responsibility to protect the nation. A notable figure of the late Yamato period was Prince Shôtoku (573-622), a patron of Buddhism and man of letters who governed as regent. Under his rule, Japan based its first centralized government and constitution on Confucian models, Buddhist temples multiplied, and official relations with China expanded through frequent delegations. The twin influences of Chinese culture and Buddhism define the late Yamato and Nara (710-84) periods. A writing system was developed by adopting Chinese characters to represent the native Japanese language. With this advancement, literature flourished, culminating in the Manyôshû, (Collection of Ten Thousand Leaves), a compilation of poetry gathered from across the realm. The expanding impact of Buddhism led to the crowning achievement of Nara culture: the casting of the Great Buddha, a statue 53 feet high and made up of 1,000,000 pounds of metal. 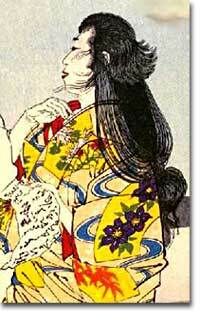 Sei Shônagon, author of The Pillow Book, was a rival of Murasaki, author of The Tale of Genji. Japanese women wrote much of the classic Japanese literature during the feudal period because it was considered beneath a man at court to write in any language but Chinese. The shift of the capital from Nara to what is now Kyoto marks the beginning of the Heian period (794-1185), a time of increasing political uncertainty but also great cultural achievement. The emperor and various aristocratic families of the court ruled Japan but were often more concerned with aesthetics and political and romantic intrigue than with governing the realm. The most influential of these families were the Fujiwara, a powerful faction that engaged in marriage politics and manipulated emperors to hold sway at court. As aristocratic government eroded under the Fujiwara, new forces emerged: the warrior class, headed by the mighty Taira and Minamoto families, slowly extended its power through the provinces and later Kyoto itself. An increasingly powerful Buddhist clergy also asserted itself: politically, by allowing former emperors to take control of temples, and militarily, by organizing armies of "warrior monks" who fought to preserve a temple's interests. Culture and the arts, however, benefited from the lax rule of the aristocracy. Poets perfected the waka, or Japanese verse, as a literary form, and made it a basis for courtly communication and competition. The Tale of Genji (Genji Monogatari ) by Murasaki Shikibu, considered the world's first novel, paints a detailed and delicate picture of life and love at court. And never will forget you. Lady Kataiko, 11th century. Example of a waka poem. Aristocratic refinement shaped Japanese etiquette and aesthetics in ways that persist even today. Modern Japanese sigh just as wistfully as their aristocratic Heian ancestors about mono no aware, "the fleeting nature of things," even as they make merry and watch cherry blossoms scatter in the breeze. What if the government paid people to write fairy tales? That's just what the government of Japan did in 712 C.E. Read about the first Japanese works and the five subsequent literary periods here. The Web Kanzaki also offers links to some of Japan's classic texts. The most important artistic works in Japanese history from 7500 B.C.E. to the present. If the Tale of the Genji had been written today, it would've been called, "My Life as a Player." The Tale of the Genji was written in the 11th century by Lady Murasaki, a Japanese noblewoman, and contained stories of Genji's love affairs with a number of women. 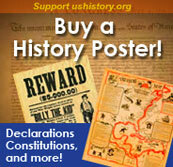 Read about the world's first novel at this Pacific University students' website. The first records of Japanese women suggest that they were considered equal to men. By the Heian period, however they were stuck in loveless marriages and considered worthless by the holy men of Buddhism. This Washington State University website shows how the women of feudal Japan fell from grace. Even if you don't speak Japanese, you can appreciate five of the 4500 poems of the Manyôshû — an Imperial anthology of verse collected throughout the realm — thanks to the English translations on this poetry fan's webpage. See pictures — and if you read Japanese, look at a map — of the places mentioned in the poems. The writer becomes the written — Murasaki Shikibu, the author of The Tale of Genji, is the subject of this novel by American author Liza Dalby. Explore this work of biographical fiction — as presented on this attractive website — to meet the main characters and understand the cultural and historical context of this literary tribute to Lady Murasaki. Without pottery, we would know even less about Jômon culture than we do now. Thanks to these rope-patterned pieces, though, archaeologists have been able to figure out a number of things about Jômon society that would have otherwise remained a mystery. Read how these vessels were created, how they were used, and who made them at this webpage devoted to early women artists.